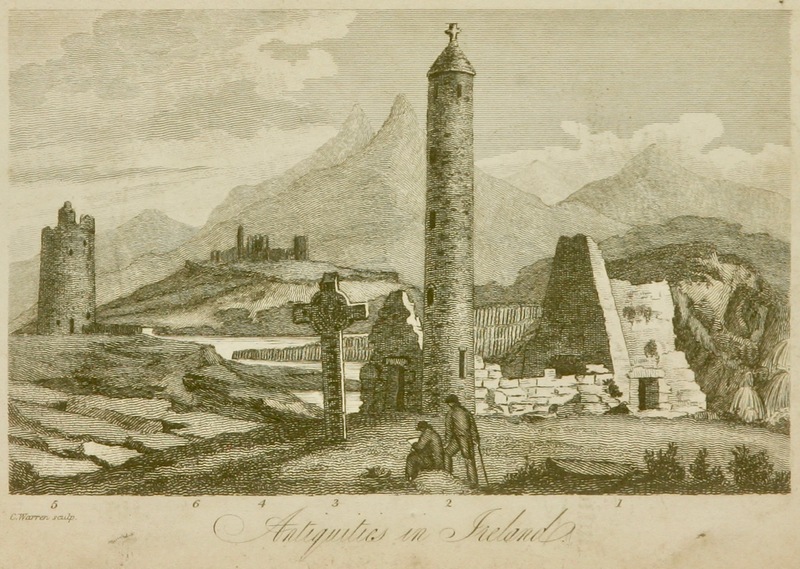 Recently I stumbled across a reference to paintings that had been moved from Skibbereen Cathedral to a small country church – St Barrahane’s Catholic Church in Castlehaven on the road between Skibbereen and Castletownshend. The paintings were moved because the large church in Skibbereen was undergoing renovation. 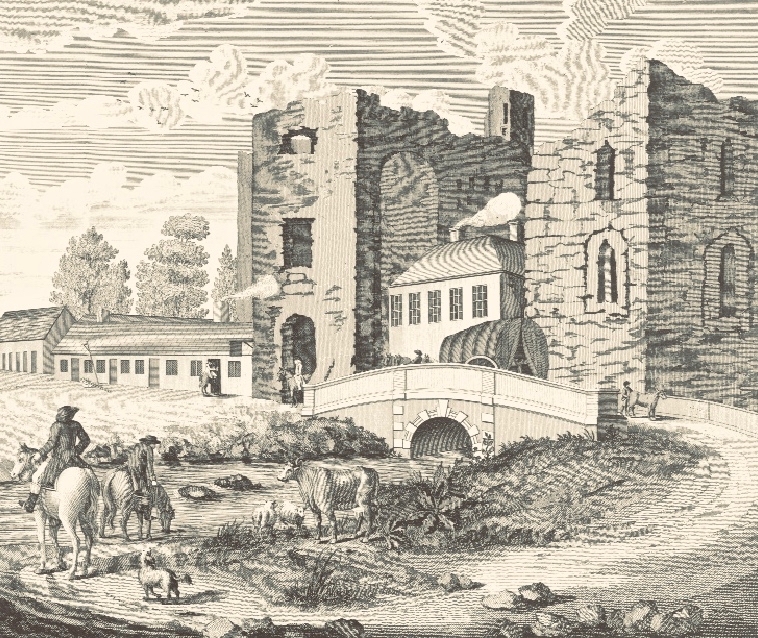 While some records indicate that this may have been in the 1840’s or 1850’s, in fact the more likely date is that they were moved to facilitate the 1881 to 1883 major re-furbishment in the Skibbereen Cathedral in which a semi-circular chancel was built to accommodate the altar, with stained glass windows behind it. However, it is possible that the paintings were not hanging behind the altar, but on a side wall, in which case the date of 1840s would be correct since this was when the side galleries were added. 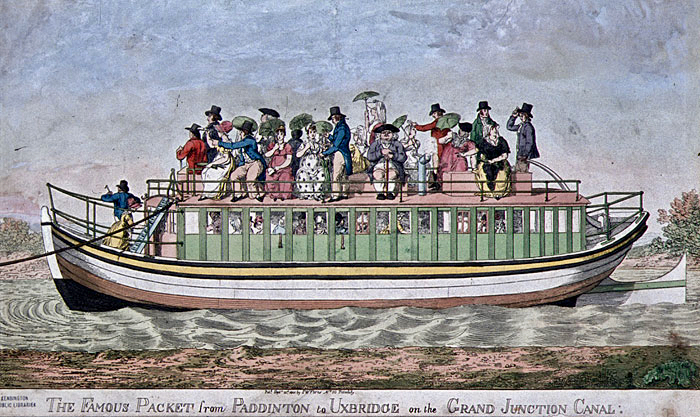 What we do know is that they were painted in 1826 over the course of three days in November. We know this from the artist’s diary. And the artist? None other than Samuel Forde, the re-discovered Young Raphael of Cork, who died two years later at the tragically young age of 23. While Forde had never been totally forgotten, he was hardly a household name. But a few years ago, two brilliant young researchers, Michael Waldron and Shane Lordan stopped to contemplate his unfinished masterpiece, Fall of the Rebel Angels, in the Canova Casts Hall in the Crawford Gallery in Cork, and were overwhelmed with a desire to know more about its creator. 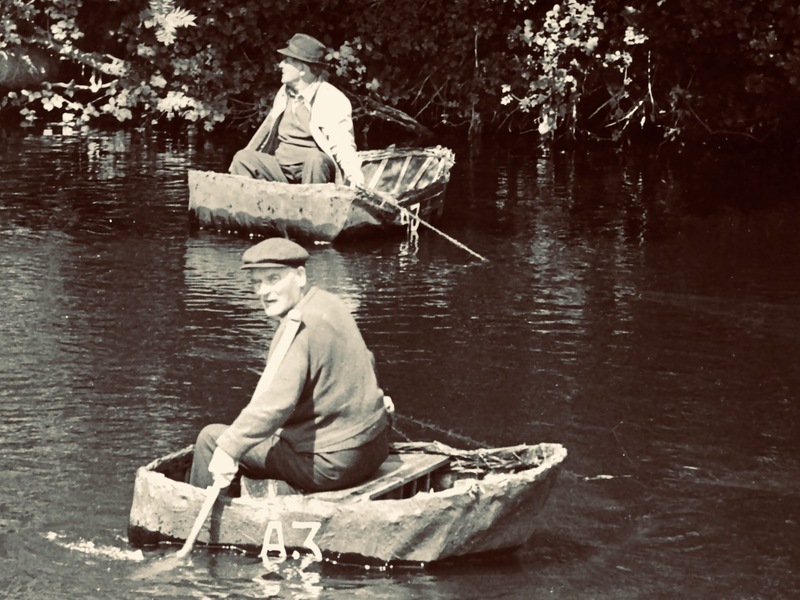 This led them on a journey they could never have predicted, to curating an exhibition, writing the catalogue for it, and becoming the experts on Samuel Forde. 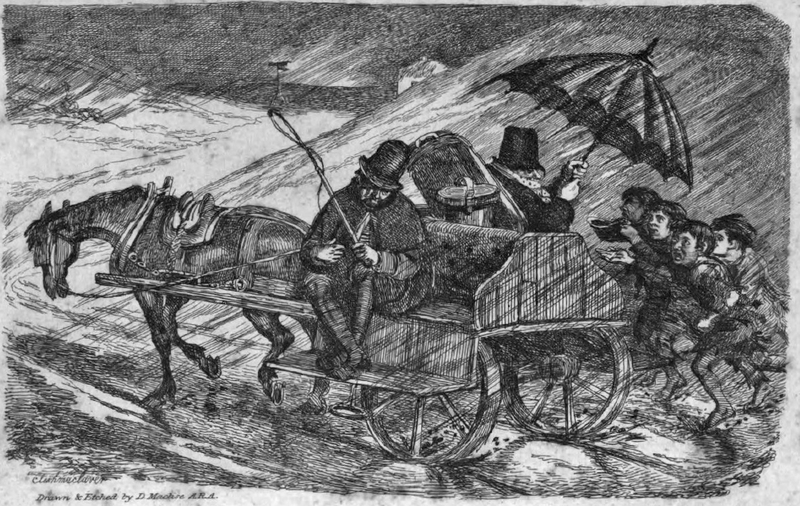 Along the way, they wrote a blog about their discoveries, and I refer you to that blog for their charming and engaging account of their initial encounter with Forde and their growing sense of him as the least-known member of a golden circle of Cork nineteenth century artists, a circle that included Daniel Maclise and John Hogan, preceded and influenced by James Barry. 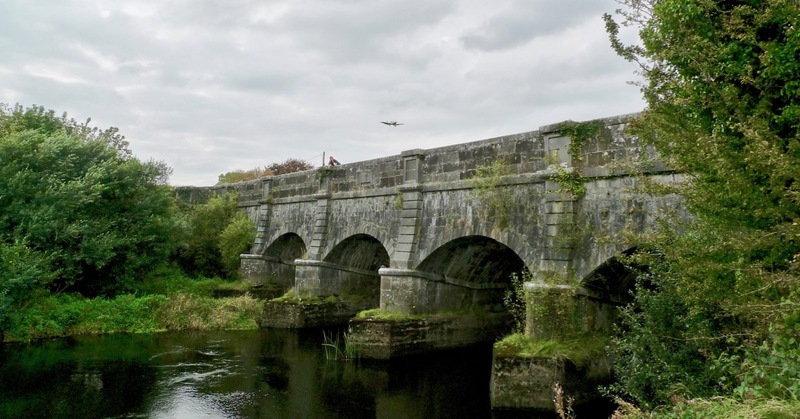 The blog also documents what is known about ‘our boy Sam’ as they came to call him, his life circumstances, his influences and his untimely death. Michael and Shane have also written on Forde for the Irish Arts Review. Incredibly, the triptych is the only finished painting we know of by Samuel Forde, apart from his self portrait. Most of his other extant work consists of sketches, studies for his Fall of the Rebel Angels, a monochrome ‘bodycolour’ (a type of watercolour) and of course his great but unfinished Fall. We know he painted theatre sets and also ceilings, but none of these have survived. The triptych was commissioned by the church in Skibbereen, who asked another painter to do it. 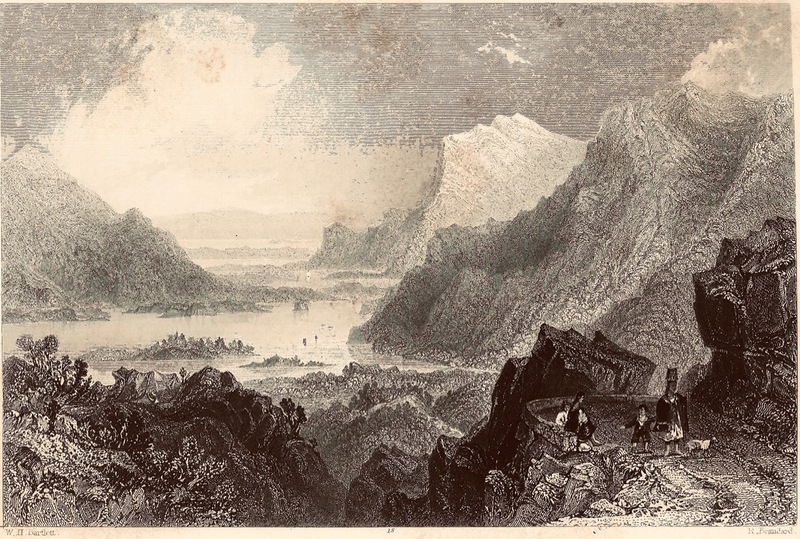 But that painter was more comfortable with miniatures, so passed on the commission to Forde, who produced it in one enormous and sustained burst of energy, using the skills he had acquired as a theatrical set painter working with distemper. The central scene is the Crucifixion, flanked by Mary on the left and Patrick on the right. The Crucifixion is assured and emotive, depicting Christ on the cross with the Three Mary’s (his mother, her sister Mary the wife of Clopas and Mary Magdalene – based on John 19:25). The Virgin Mary has collapsed into the arms of her sister, while Mary Magdalene weeps at Jesus’s feet. To their right is a figure that is interpreted as John, although John is usually depicted as young and smooth-faced. This figure, however, is bearded, elderly, and strikingly apparelled in a turban and long red robe. Perhaps Forde’s influence here is one of Tintoretto’s Crucifixions, in which a similarly turbaned figure is presented. The Mary painting on the left shows her as she is in the crucifixion scene, but with a crescent moon and a snake under her feet. The snake represents evil, of course, and is a common element of Marian imagery – take a look at the next grotto or church statue of Mary that you come across. The moon is from Revelations 12:1 – And there appeared a great wonder in heaven; a woman clothed with the sun, and the moon under her feet, and upon her head a crown of twelve stars. This is the same verse, by the way, that describes the fall of the angels – a subject that was to occupy Forde as he worked on his great unfinished canvass. St Patrick is shown in his episcopal robes, with snakes slithering away, carrying his crozier and wearing his bishop’s mitre. Close examination of the canvass reveals that the Mary and Patrick paintings were intended to to be framed as ovals (as with his self-portrait) rather than rectangular. They were, apparently, conserved in the 1970s but look as if they may need some attention again. What a treasure to discover in a small country church! If Samuel Forde had lived there is no doubt his career would have been as illustrious as that of his contemporaries Maclise and Hogan. Michael and Shane hope that more of his works will turn up in the future. Meanwhile, you can view Fall of the Rebel Angels in the recently and marvellously revamped Canova Gallery at the Crawford, and marvel that in quiet Castlehaven, by a series of circumstances, there exists such a testament to the Young Raphael of Cork. 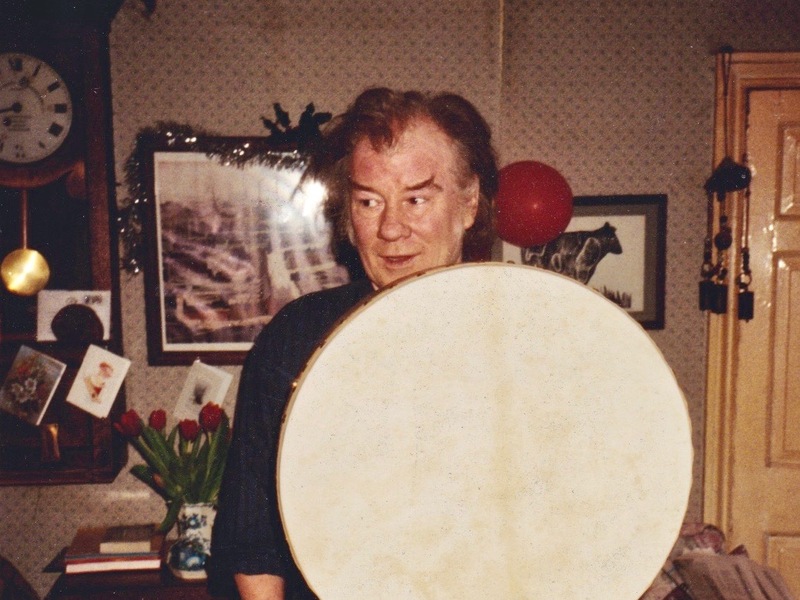 Our good friend Danny – who sadly passed away in 2017 – was a bodhrán maker. 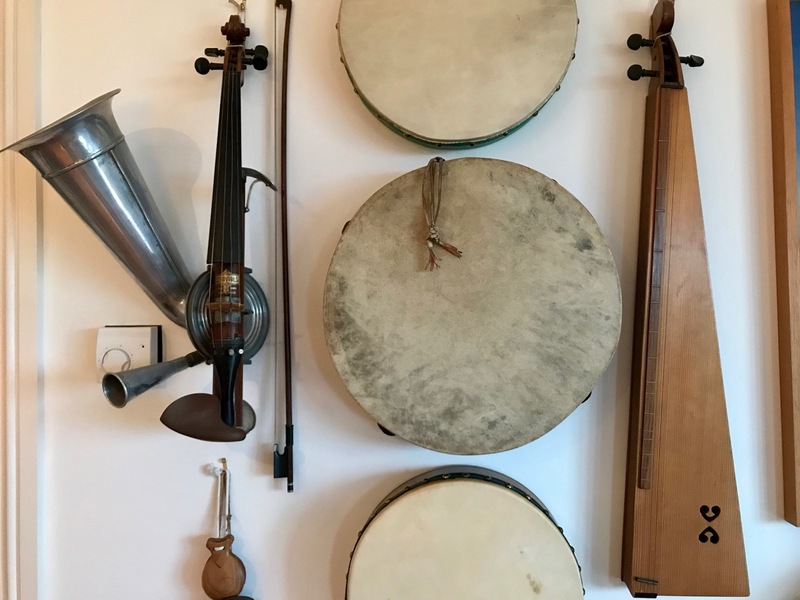 There are still shelves of his instruments in his West Cork house (above) and he is well remembered by all the musicians who commissioned instruments from him – including the percussionist of the New York Metropolitan Opera Orchestra! I first met Danny in the 1970s when we both lived in North Devon: a very ‘Irish’ part of the West Country in the UK. I was a frequent visitor to Lovistone Barton, a remote old farmhouse at the end of a long trackway, which Danny and Gill then occupied with their five daughters, surrounded by chickens, geese, goats, dogs and cats. There was always a warm welcome and chat to be had and over the years I became familiar with every stage in the production of the bodhrán. 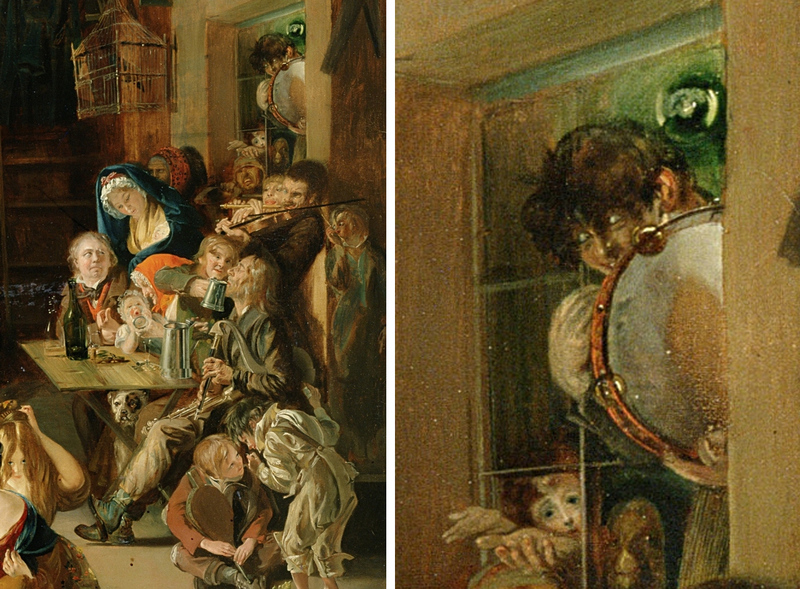 Two details (above) from a painting by Cork-born artist Daniel Maclise (1806 – 1870): Snap-Apple Night, based on a Hallowe’en party in Blarney in 1833. The left-hand panel shows the musicians – pipes, fiddle and flute – and, above them, a glimpse of a rather demonic drum player, enlarged in the right-hand panel. 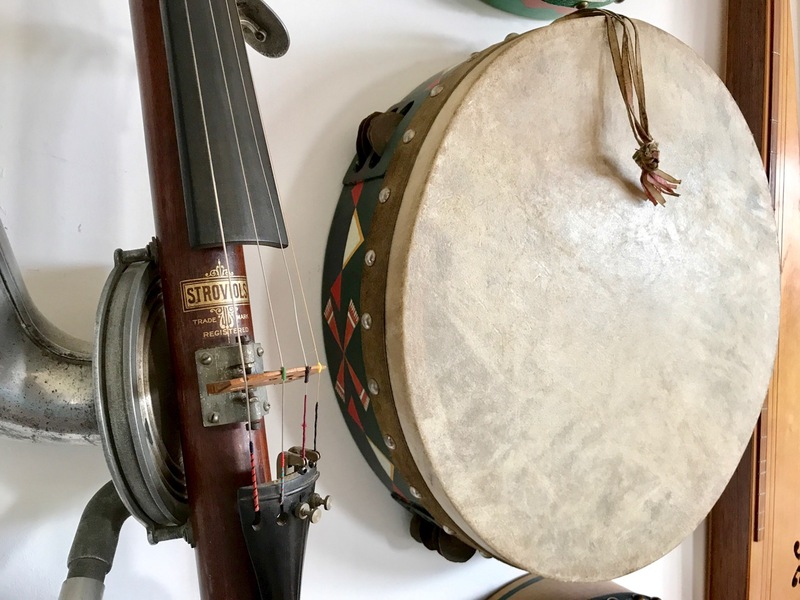 Danny was fascinated by this portrayal of the instrument, to all intents and purposes looking like any other bodhrán, except that it is shown with jingles, like a tambourine. 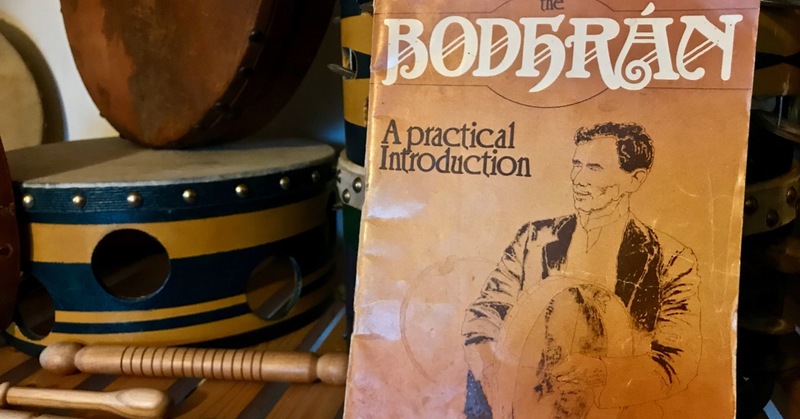 It has been suggested that the words Tambourine and Bodhrán are related but, other than this comprehensive Comhaltas essay, I have yet to read any definitive historical research that convincingly justifies an etymology for the term. Danny made me a ‘bodhrán-tambourine’, based on the Maclise painting, and it’s now hanging in our music room in Nead an Iolair (above). For the jingles, Danny took a number of old penny coins and beat them out, giving them a slightly domed shape as well. When tapped or shaken they sound really good, and extend the possibilities of the instrument by adding a metallic, percussive sound. But I doubt that purist bodhrán players approve, although I have seen and heard other instruments made in this fashion. If you want to get a feel for the full gamut of attitudes to bodhráns and their players, this discussion on The Session is salutary: there are rants galore! 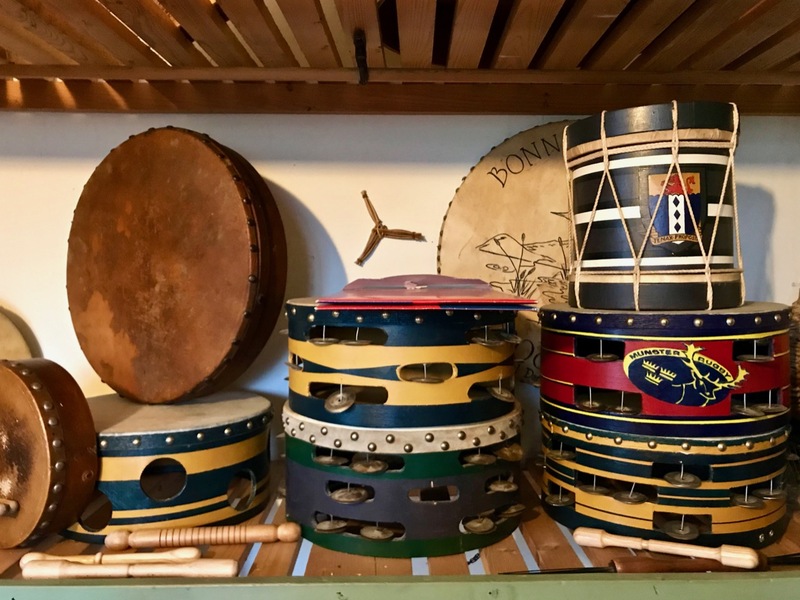 For me – as a squeeze box player – I am happy to have a bodhrán player contributing to our gatherings. As demonstrated in the examples above, ‘good’ players who have mastered their craft are well worth listening to . . .
Hallowe’en is big in Ireland. 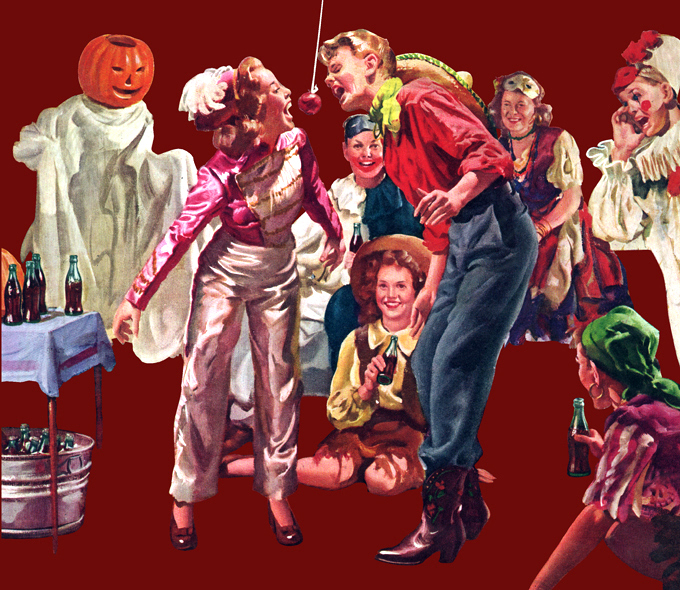 It has always been celebrated and is, of course, an opportunity for children in wonderful spooky disguises to go out collecting sweets and treats. But this – the ‘Day of the Dead’, and traditionally the beginning of the winter – has generated far more elaborate customs than any I have encountered before. Have a look at this parade which takes place in Shandon, Co Cork. 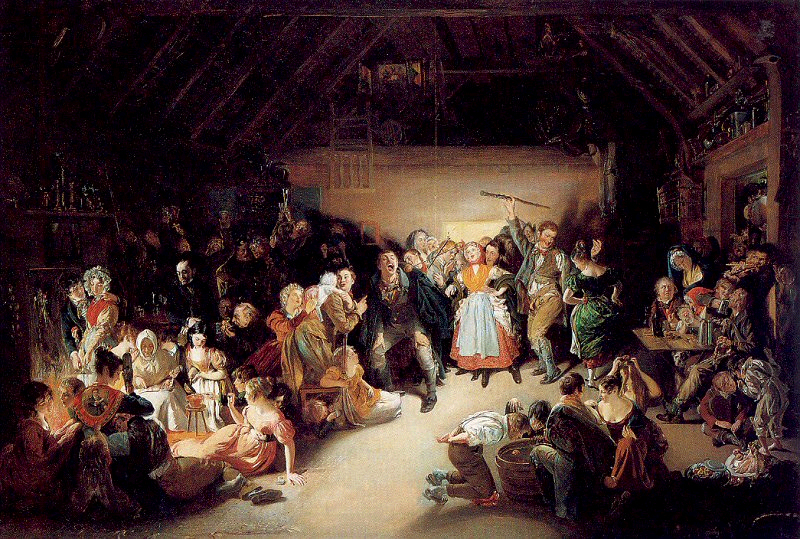 The origins of Samhain (Oiche Shamhna in Irish) seem to be an old Irish festival marking the first day of winter and the ending of the farming year. 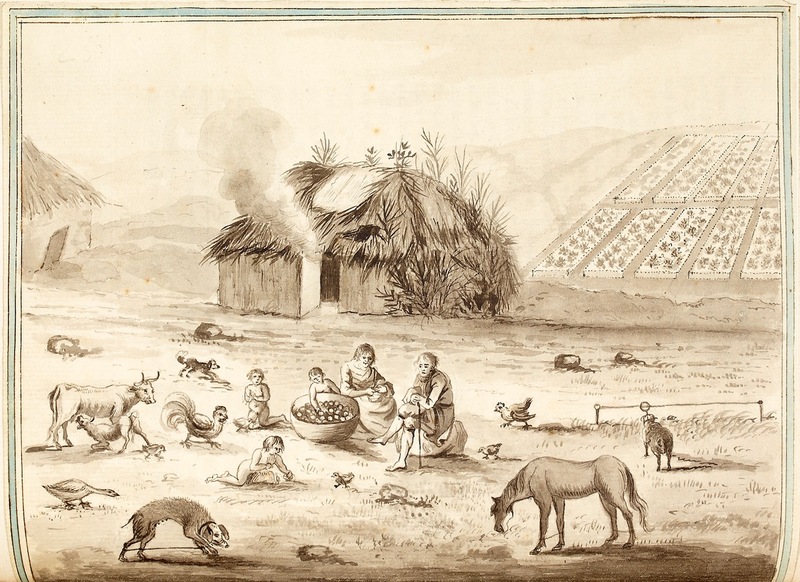 All crops had to be in and safely stored – hay, potatoes, turnips, apples – and cattle and sheep were moved from mountain and moorland pastures and brought closer to the farmstead; milking cows were brought inside for the winter and feeding with stored fodder began. Turf and wood for the winter fires must have been gathered and dried. If fires were lit year-round – for cooking – they had to be allowed to go out for the one night and were then lighted again in the morning: this custom still survives in some Irish households. Fire is an essential element in the festival. The word ‘bonfire’ is supposed to be derived from ‘bone fire’ – the burning of the bones of the animals slaughtered before the onset of winter once the meat had been prepared and preserved to keep the larder full through the cold bleak months to come. 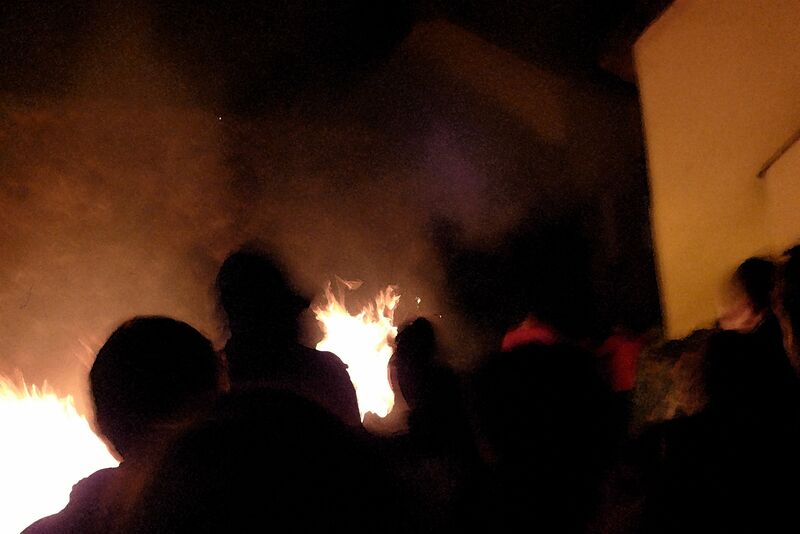 It’s no coincidence that in England bonfires are lit in early November to ‘remember’ Guy Fawkes and his plot to blow up the House of Lords in 1605: this was just a continuation of fire festivals that already happened then – and are still happening now. 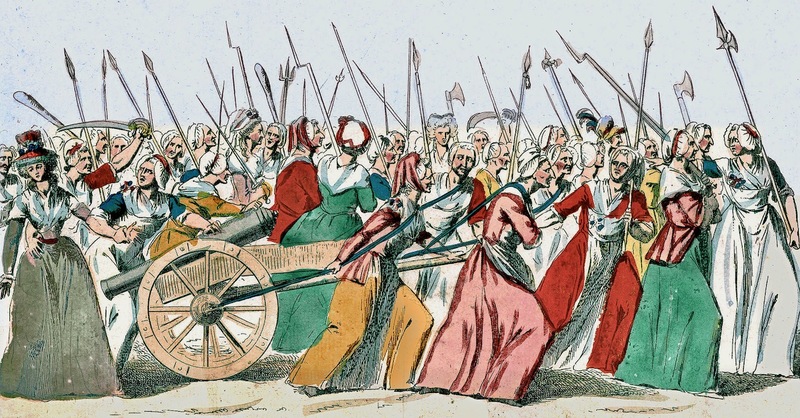 When I lived in Devon I came across (and took part in) traditions of pulling burning barrels through the streets (Hatherleigh) or carrying burning barrels through crowds of spectators (Ottery St Mary). West Country carnivals were common at this time of the year, and many were accompanied by flaming torches and fireworks. 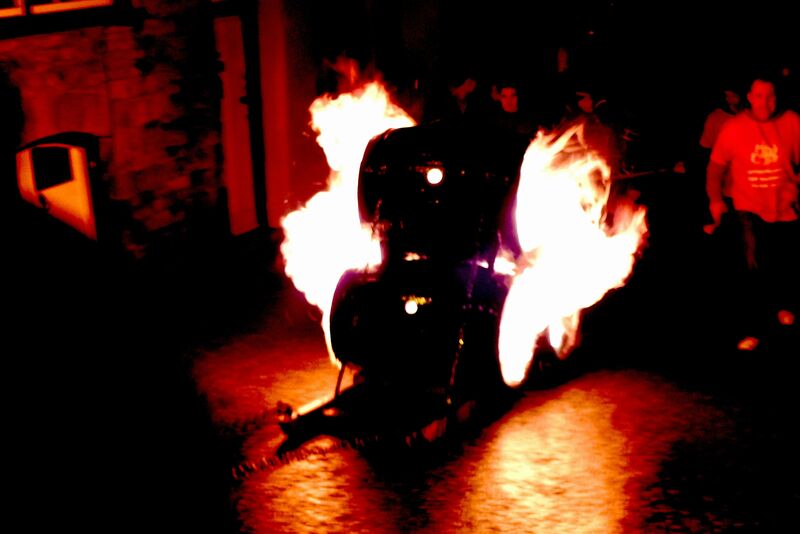 It has always seemed necessary to ‘lighten’ and warm the darkening year with fire. 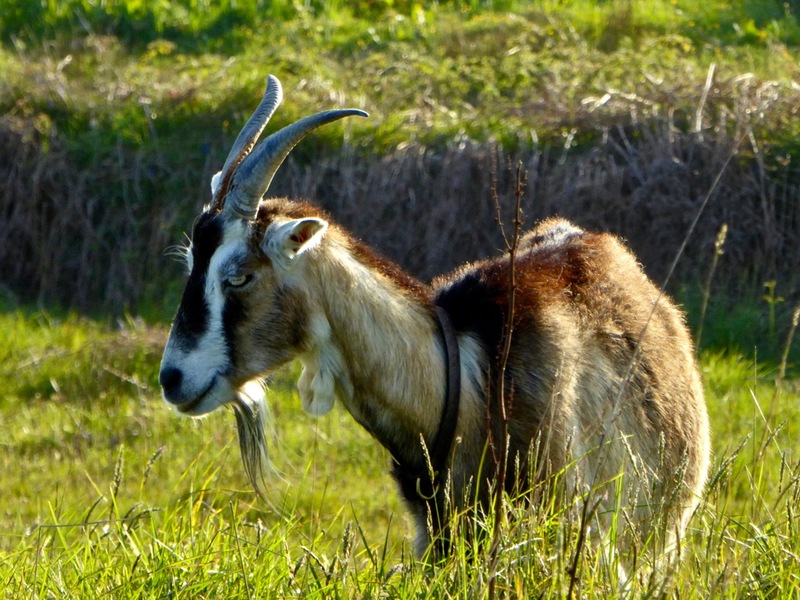 The Púca of Knocnaphuca …The old people would feed the Púca of Knocnaphuca on ‘Snap-apple Night’, or indeed, whenever one had a call to travel up the hill. It was the wise person that fed the Púca the night before going up. Milk and cake would be put on a plate and left outside the house and by the next morning the food had always gone! 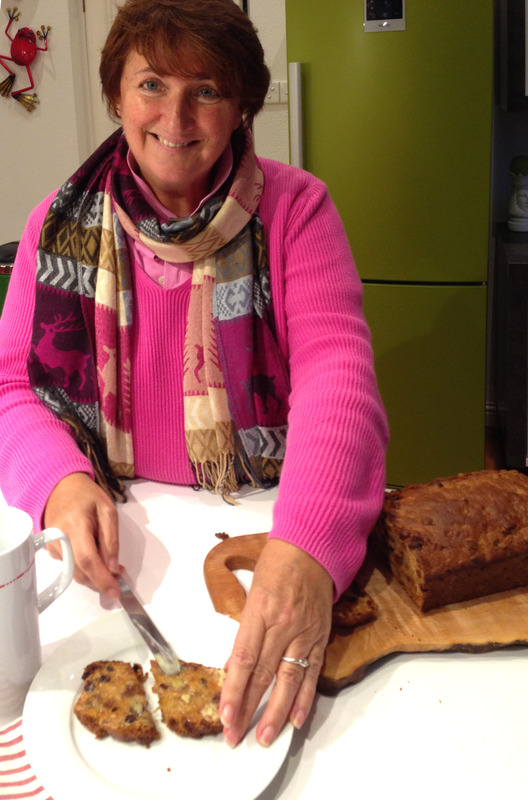 I like Finola’s tradition for Samhain: making (and tasting) a Hallowe’en barm brack… Delicious!